Me VS. The Sugar...: How Much Sugar is in that? Sure, 13 grams of sugar seems harmless, but have you ever wondered what it actually looks like? Then, when you see a tiny little Nutrigrain bar stacked up next to those 13 grams, doesn't it make you reconsider how healthy the Nutrigrain bar really is? If you'd like to see more of these amazing pictures, head on over to Sugarstacks. You'll be amazed at some of those pictures! According to WikiAnswers, your daily sugar intake should be somewhere around 40 grams of refined/processed sugars for a 2000 calorie diet! On a good note, there doesn't seem to be any limit on natural sugars!!! Woo-hoo!!! My cravings for edamame madness are still in full force, and it's sad to say that my supplies are running low. Oh no!!! 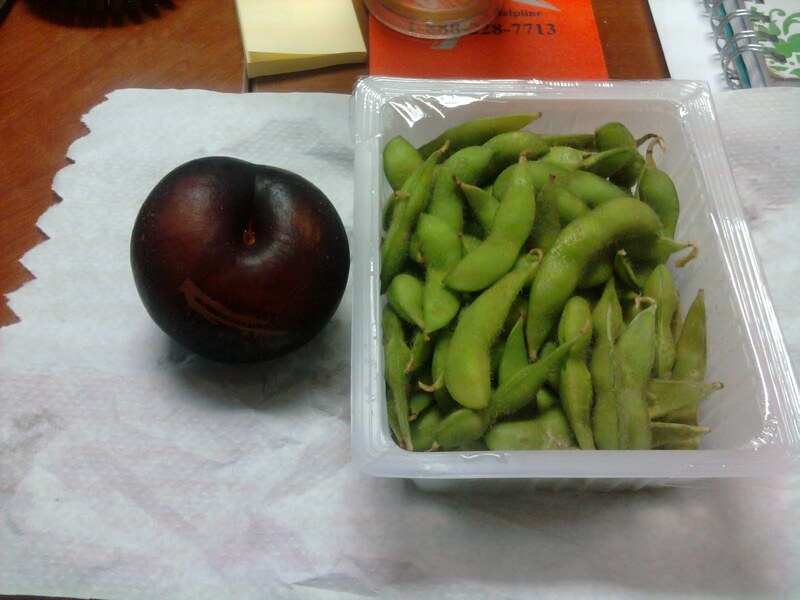 I paired my edamame snack it with a juicy red plum and I'm powering through the day! I had to share this with you guys, leave it to those Labs to do something like this!